Today I get to share one of my newest sponsors, The Wishing Elephant! Carolyn is based out of New Hampshire and makes THE most amazingly quirky baby onesies and toddler clothing with her creative appliques. 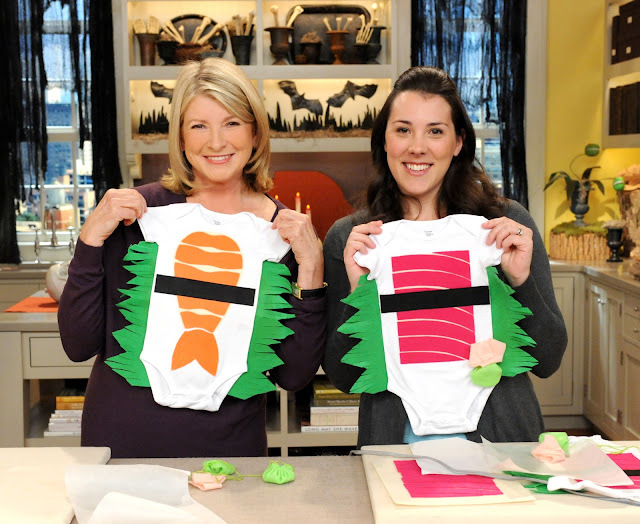 She's even been featured on the Martha Stewart Show, showing how to make her sushi costume design. SO COOL! Every Etsy shop owner's dream, am I right? "I try to make clothes that will make people smile. I'm a mom too. I'm tired, covered in food and in desperate need of a laugh. If my shirts make you giggle, I've done my job." PS Would you like to be featured on Oh, Sweet Joy? Email me at ohsweetjoyATgmailDOTcom for sponsorship and advertising rates. These are so cute. Would love some for my little girl! I have been eyeing the bowtie onesies for a while, but the toddler cardigan might be might be my new favorite! I love all the quirky onesies, but my favorite is the blooming pinks bodysuit. 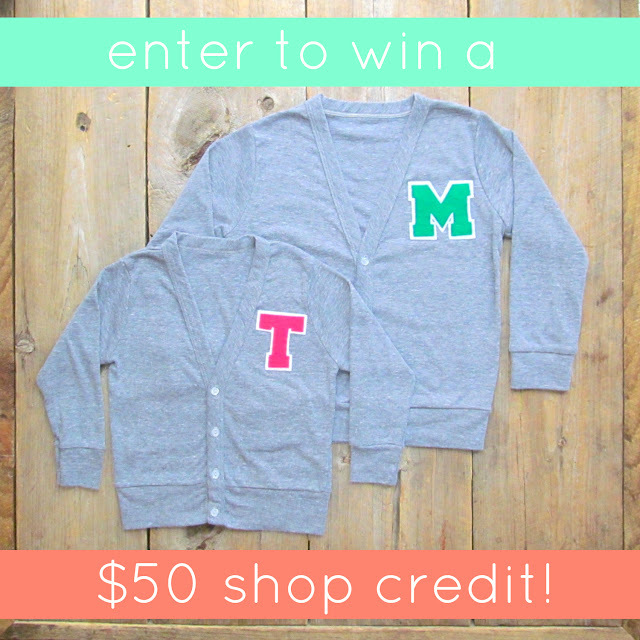 I LOVE the little prepster cardigan and the letter cardigans! Oh my soul! 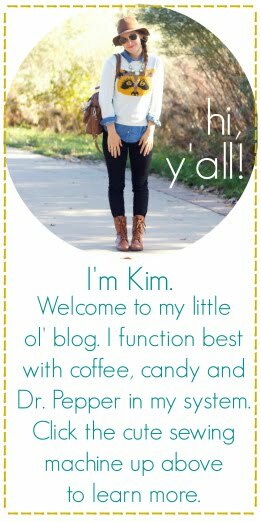 I love love love the Personalized Toddler Letter Cardigans! My little guy would look to stinking cute in one! I'm expecting and I love looking at my cute little munchkin in those onesies! I adore the personalized children's letter cardigan! I like the toddler butterfly costume! I don't know how you could not love the sushi outfits.. but I also love the violin onesie !! I love all the onesies but those sushi ones are so stinking adorable!! I love the bow tie onesie! Revenge of the nerds is adorable. I love it! i love the wishing elephant onesie! I would love the sweater with the M since my son is 3 and his name is Mak. I love the butterfly costume! So cute! I think baby groucho is so precious! adorable!!!! can't decide between the letter cardi's and the revenge of the nerds onsie!! so precious! These are so cute! I would give this to my friend who is having a baby in a few months. I love so many of these. We are expecting our first baby this summer, I'd love to win! I also pinned your cozy winter outfit http://www.ohsweetjoy.com/2013/01/cozy-winter-outfit.html on my Momma Style pinterest board! Would love to use this to buy gifts for my friend who just had a baby boy! Love the little baby varsity sweaters ... too cute. Such cute things! I would love some onesies for my baby due in June! I LOVE the gameboy-ish one! So cute. AND pretty much everything was my favourite. I like this shop a lot. Too bad I don't have my own babies. Oh well, I'll just dress my niece. I love the boy bowtie onesies! I love the marshmallow over the campfire onesie. Those sushi onesies are just the very very best! I love the little prepster toddler cardigan. The hostess cupcake onesie is my favorite! It's so darn cute! The Personalized letter cardigans are so cute! I like the sushi outfits. So cute! They are all so cute, i love the VW love bus onesie.. I've been crushing on The Wishing Elephant for months now, I'd LOVE to win! I'd love the red anchor bodysuit! These onesies are seriously adorable! Oh I LOVE the campfire onesie (marshmallow campfire I think). I've been eyeing it for a while! We're going on our first camping trip with the little man in April and it would just be perfect. I love these sweet cardigans! Really loving the Hostess Cupcake Costume! So sweet! I like the sushi outfit or the Woodland Gnome. Everything is so cute!